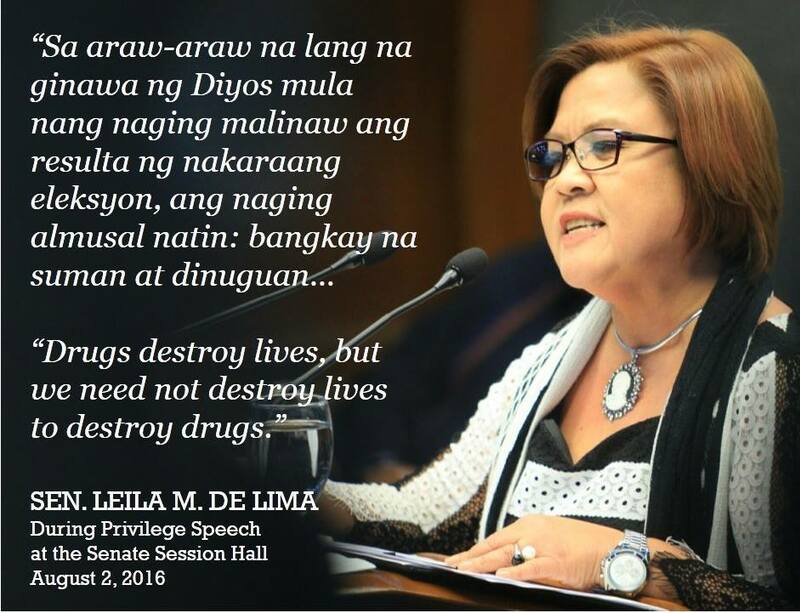 MANILA, Philippines - Senator Leila M. De Lima on Tuesday, August 2, decried the prevailing "do-it- yourself justice" system carried out under the Duterte administration's war against illegal drugs that resulted to the unabated spate of extrajudicial killings and summary executions in the country. In her first privilege speech at the Senate, De Lima said this latest brand of justice flagrantly disregards the basic rights to due process of the law of innocents and suspects alike as guaranteed to them under the Constitution. "We have to continue opposing the murder of the innocents as well as that of the suspects. We must call for the accountability of state actors responsible for this terrifying trend in law enforcement, and the investigation of killings perpetrated by the vigilante assassins," she said. "In the campaign against criminality, we cannot applaud criminal methods merely because we are left unaffected. Life has more value than an accusation written on a piece of cardboard whether you are rich or a scum of the earth. Needless to say, all lives matter," she said. Based on the official records of the Philippine National Police, there are about 395 drug offenders who were killed in police operations - or a daily average of 13 deaths every day from July 1 to Aug. 1. However, for instance, a media research group showed that since May 10, there have been 748 individuals killed in the administration's campaign against illegal drugs, of which 464 were from police operations, 215 by unidentified gunmen and 69 salvaged. "Higher figures are even reported by certain media outlets. I am not saying that all or most of those incidents are cases of summary killings. But several do have telltale signs that several are," the neophyte senator noted. The former justice secretary explained that the sheer figures of deaths by extrajudicial killings and summary executions seems to numb some people desperate to weed out the cruelty of illegal drug trade on Filipino families, especially among children. "The fact that our attention span has waned as I enumerated only a fraction of these killings already shows how desensitized we have grown to the killings as mere numbers and statistics," she said. "We must force ourselves to be reminded that the victims are always flesh and blood to their families and loved ones. Hindi sila suman o dinuguan (They are not rice cake or pork blood stew)," she added. De Lima also lashed out at her critics and detractors who tried so hard to malign her good name and reputation in order to discredit and decimate her from pursuing a Senate investigation into the series of extrajudicial and vigilante killings. "I cannot stay silent in the face of all these blatant lies created in the backroom of a media strategy office suite. I will not fall without a fight," she said, mindful of the malicious demolition campaign launched against her by some quarters. "I will not go into that good night without nary a whimper, while all these misguided men use the President's war against drugs as their platform to destroy any elected public official who dares question the methods by which this war is waged," she added. The Senate justice and human rights committee she chairs and the Senate public order and illegal drugs chaired by Sen. Panfilo Lacson are expected to open a joint Senate investigation into the spate of extrajudicial and vigilante killings this month.